SAINT AUGUSTINE – Lightner Museum’s New Educator’s Tours August’s tour will be a 45-minute interactive tour presented by Lightner Museum’s educator and program coordinator, Ellen Morfit at 10a.m. on Aug. 1. 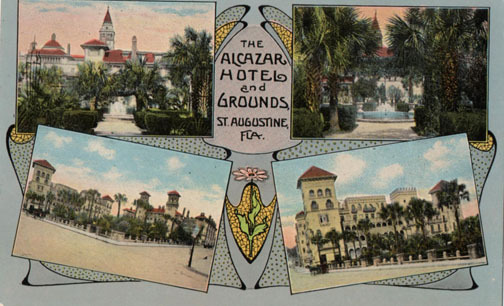 The tour titled, “The History of the Alcazar Hotel and the Lightner Museum”, will use primary source materials (maps, newspaper articles) to trace the history of The Alcazar Hotel and The Lightner Museum. What made Henry Flagler build the Hotel, and what factors contributed to its closure? What historical event prompted Otto Lightner to start collecting, and eventually, move his collection to Saint Augustine? Join our educator as you participate in an engaging look at US history told through the Museum. After the tour, Guests are invited to participate in the antique mechanical music demonstration beginning at 11 a.m. Monthly Curator’s Tours will resume on Wednesday Sept, 5. Please note: the Lightner Museum has recently updated its pricing structure. For more information or to purchase tickets, visit www.lightnermuseum.org/tickets. For more information on programs and events happening at the Lightner Museum visitwww.lightnermuseum.org.